July 09, 2018 at 12:10 am. BALTIMORE — The New York Yankees can make up some ground on the first-place Boston Red Sox with a doubleheader against the struggling Baltimore Orioles on Monday at Camden Yards. New York trails the Red Sox by two games in the American League East after winning two of three against the Blue Jays over the weekend. The Yankees won’t have much time to recover after needing 10 innings to beat Toronto 2-1 on Sunday. Meanwhile, the Orioles have lost 12 of 13, including a four-game sweep at the hands of the Minnesota Twins this past weekend. Baltimore fell to 24-65, the worst record in the majors. 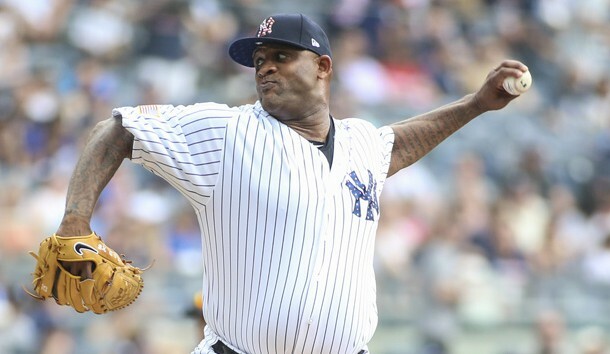 Yankees left-hander CC Sabathia (6-3, 3.02 ERA) will start Game 1 of Monday’s doubleheader at 4 p.m. Sabathia pitched well in his last outing against the Braves when he allowed two runs over six innings on Wednesday in a 6-2 win. Sabathia did not get a decision in a 7-3 14-inning loss to the Orioles on April 6. He is 19-10 in 42 career starts against Baltimore. The Orioles will recall Jimmy Yacabonis from Triple-A Norfolk to make the start against the veteran Sabathia. Yacabonis (0-0, 8.53 ERA) has not pitched for the Orioles since June 28 when he allowed two runs over four innings and took the loss in a start against the Seattle Mariners. He has pitched five career games against the Yankees, allowing seven runs and seven hits over 6 2/3 innings. New York has a similar scenario for Game 2 as right-hander Luis Cessa (0-1, 5.00 ERA) will be promoted from Triple-A Scranton/Wilkes-Barre to make the spot start. Cessa has appeared in five games, including one start, for the Yankees this season. He last pitched in the majors June 27 against the Phillies when he took the loss after allowing three runs and five hits over three innings. Cessa also threw one scoreless inning against Baltimore out of the bullpen on April 7. He is 1-1 with a 4.97 ERA in three career games (two starts) against the Orioles. Baltimore will also have a young right-hander on the mound for the night cap with Yefry Ramirez (0-2, 2.51) scheduled to make his third career start. He allowed two runs (one earned) over five innings in his last start against the Phillies on July 4. New York could have left-handed closer Aroldis Chapman (left knee) and OF Aaron Hicks (left hamstring) available for the doubleheader in Baltimore. Both players exited Saturday’s game with injuries and were held out Sunday.